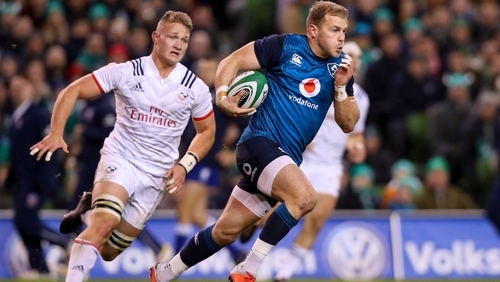 Ulster and Ireland back Will Addison has been ruled out for the rest of the season after undergoing back surgery and will face a fitness battle ahead of the World Cup. The 26-year-old full-back / centre has been out of action since hurting his back ahead of training for the Six Nations campaign. Addison, who moved to Ulster from Sale last summer, won two Ireland caps during the November internationals. Ulster said: "Will Addison has had recent back surgery. It is hoped that he will return to full fitness for pre-season." The Guinness Pro14 kicks off in late September, four weeks later than normal due to the World Cup in Japan. Ulster told RTÉ Sport that they don't have a confirmed date for the beginning of their pre-season at the moment. In non-World Cup seasons it would generally start at the beginning of July. Joe Schmidt's side have four friendly fixtures before the World Cup, beginning with a home game against Italy on 10 August. Ulster, currently second in Conference B, also confirmed that Stuart McCloskey sustained a concussion in the game against Glasgow Warriors last weekend and will follow the return to play protocols. Dan McFarland's men face an away clash against Edinburgh on Friday.